Hit-and-run accidents are, unfortunately, very common across the United States. Drivers are afraid of owning up to accidents they cause and will flee the scene to avoid liability. Fleeing the scene of a crash, especially where there were injuries, is not only cowardly but is also illegal under Oregon law. A recent crash in Portland was made even more grievous by a driver who ran away from the accident on foot, leaving behind severely injured passengers in his own car. 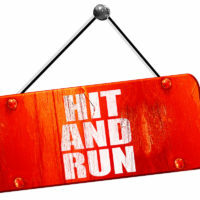 Read on to learn more about the Portland hit and run accident. At around 12:04 a.m. on a recent Sunday, police responders were alerted to a crash that had occurred in the 3800 block of Southeast 92nd Avenue in Southeast Portland, just south of Powell Boulevard. A 29-year-old Portland man was speeding south on 92nd Avenue when, according to reports, he lost control of the vehicle and crashed into several parked cars. He eventually came to a stop, and the crash was called in. The driver, however, then ran away from the scene of the crash on foot, leaving behind his two passengers. One of the passengers, a 34-year-old woman, was transported to a nearby hospital with life-threatening injuries. Her fiancé was treated at the scene for minor injuries. According to reports, the woman’s condition had improved as of the next day, though she remained in serious condition. Under pre-existing Oregon law, a person involved in a crash involving injury or death is required to stop, provide aid to the injured parties, and remain at the scene to exchange information with the police or other people involved. Police searched for the 29-year-old Portland man who fled the scene following the accident described above, eventually arresting him two days later. He was charged with two felony counts of failure to perform the duties of a driver to injured persons, as well as two misdemeanors. A new Oregon law, effective January 1, 2019, expands the existing duties and now requires drivers to stop and investigate whenever they think they might have hit something. Even if they realize later that they hit something or someone earlier, they are required to take some action, including calling 911 if the driver believes they may have been in a crash that resulted in an injury. Drivers who fail to perform their required duties following a crash can be charged with a felony. In addition to criminal liability, fleeing the scene of a crash opens drivers up to significant civil liability in a personal injury lawsuit. Running from the scene of the accident is strong evidence of culpability for the accident. Moreover, a driver who leaves behind injured people rather than staying at the scene and calling for help is potentially making the injury even worse and showing a reckless disregard for the injuries they are causing, which can lead to additional compensatory as well as punitive damages. If you or a loved one has been hurt in a hit-and-run accident in Vancouver, WA or Portland, OR, please contact personal injury attorney John Lutgens to discuss your options for recovery. Holding drivers who flee the scene accountable for accidents they cause is one way to curb this problem.